Warm up before any tennis activity. This can be stretching or tennis related movements across the court, e.g. side steps, jogging or shadow tennis. 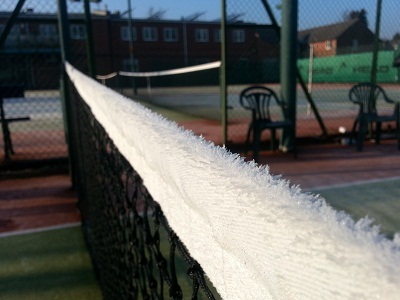 The courts can be damp for most of the winter, use this to your advantage. Mix your shots and introduce slice a little more to keep the ball low. If windy, always make your opponents smash or play shots overhead if you're under pressure. Don't go for the perfect lob everytime. Try to dominate the net in bad conditions, although this is the number one tactic in doubles, it becomes necessary in wet and swirly conditions. The balls will become heavier due to the damp conditions and, in turn, will be slower. Don't try and hit too hard - use placement and touch shots. Communication is key in doubles, especially in bad conditions. Call every shot even if it's obvious.